Like About Face Designs? Click here to view the entire range. This hilarious and robust mug makes a brilliant gift. The shining white outside and black inside contrast wonderfully, making this mug a real gem to drink out of. The hilarious message on the front is sure to bring an instant smile to your face; cheering you up on even the darkest of days (Mondays!). This message resonates with most of us, getting the days mixed up can lead to a certain kind of pain that you have to experience to believe! So why not use a mug that will cheer you up on the darkest of days? 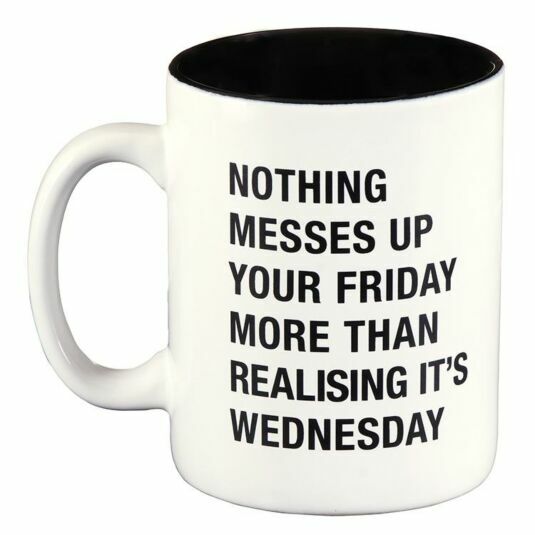 This makes the perfect gift for anyone you know who lives for Friday, and therefore gets a bit down to find out it is Wednesday. It is suitable for birthdays, Christmas, or Father’s Day. About Face designs is a hilarious and quirky range of home and fashion accessories. Featuring bold colours and witty text, it is bound to bring laughter to your life!